Suzanne Maben, gray-green waders hugging her legs, forges into the middle of Paine Run and, like a nurse monitoring a patient, records the vital signs of the stream. 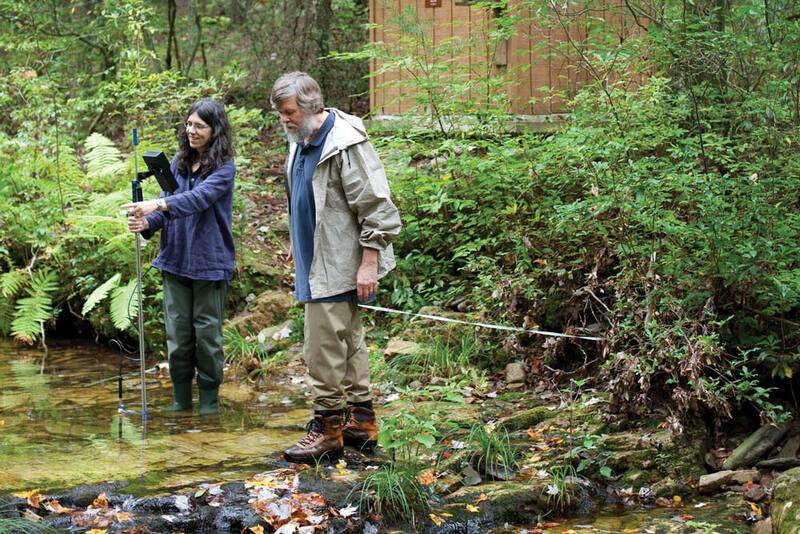 Rick Webb, senior scientist in the department of environmental sciences, and Suzanne Maben, senior lab specialist, track the water flow of Paine Run. The air is still and ripe with recent rain, and the sky is gray on this late-September day; the first blush of fall shows on the dogwoods and maples in the Shenandoah National Forest. As the water flows under the forest canopy, Paine Run seems transparent and pristine, the bedrock of pale quartzite visible below the surface. Small fish—sculpin and blacknose dace—occasionally dart among the submerged rocks and leaves. Maben runs a white measuring tape from bank to bank to gauge the width. Then she holds a flow meter—a metal rod with sensors and a digital readout—at several spots on the Blue Ridge stream’s bottom to track its depth and velocity. Finally, she moves upstream to take samples of the water, which, along with other data from the site, will be analyzed back at UVA, where Maben is a senior lab specialist in environmental sciences. Testing the Waters: At Paine Run in the Blue Ridge Mountains from UVA Magazine on Vimeo. The sampling is a weekly routine that has been going on for years, part of a larger effort that has been under way for decades. The mass of information collected as part of UVA’s Shenandoah Watershed Study (SWAS) has had a critical role in shaping public policy on the environment and shedding light on trends in various ecosystems. It also provides a scientific benchmark for water quality, the first dot in a series that connects the trail of this precious resource as it flows from the mountains to the rivers to the bay to the ocean. “The water quality doesn’t get any better as the water goes downstream. This is where it starts,” says Rick Webb, whose thick beard and ruddy cheeks create the impression of an affable mountain man. In a sense, Webb, a senior scientist in the department of environmental sciences, is a man of the mountains. For years, he has shepherded much of UVA’s water research in the national park, national forests and elsewhere in the Blue Ridge. A fly fisherman when time allows, Webb coordinates the Virginia Trout Stream Sensitivity Study (VTSSS), which is done in tandem with the watershed project. At issue is how the health of streams is affected by pollutants, to a great extent the acid rain caused by emissions such as sulfur dioxide from coal-fired power plants. The higher the levels of acid, the greater the stress on the streams; insects, fish and other aquatic life will decline or die out. Trout streams are particularly important because brook trout, the only such species native to Virginia, are the last to go when streams become highly acidic; if “brookies” can’t survive, the water is in bad shape. But scientists look beyond fish—factoring in bedrock and soil composition, variations in flow and events like gypsy moth defoliation—when assessing water quality. In the spring of 2010, more than 160 volunteers, organized by Trout Unlimited chapters in the state, collected samples from 384 streams. The findings, when compared with similar efforts in 2000 and 1987, contain some good news. Virginia’s mountain streams are recovering from earlier acidification on two fronts—concentrations of sulfates (sulfur in its water form) are down and many streams have greater capacity to neutralize acid, according to an analysis by former UVA grad student Janet Miller (Grad ’11). This improved health is linked directly to years of lower emissions from power plants, largely due to tougher emission standards that resulted from the Clean Air Act Amendments of 1990. SWAS data was instrumental in the passage of that legislation. The story of that effort dates to 1979, when James Galloway, now associate dean of the College of Arts & Sciences, teamed up with two other professors to start a study based on a model Galloway was familiar with as a postdoc at Cornell. They began on two streams—White Oak Run and Deep Run—in Shenandoah National Park, a partner in the study. 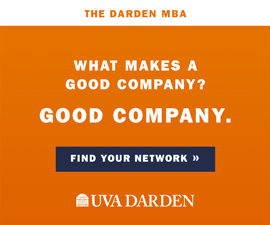 Now, UVA regularly monitors more than 60 sites. Paine Run is one of five sampled weekly; it is one of three with sophisticated solar-powered equipment that records flow data and collects samples for analysis during storms and other high-flow events. Value: Longest continuous water quality study in a national park in the U.S.
Over the decades, the information has accrued significance. “It’s like an endowment or a bank account, if you will—the more you put in, the more value it has later on,” Galloway says. The data has been scientific ammunition for the EPA to illustrate that lower levels of pollutants in the air result in improved water quality in streams. “That’s what we’ve done with the 2010 study. That’s what that shows,” he says. Research into emerging issues, such as mercury in streams and rivers, benefits from having the structure of SWAS and VTSSS in place, says UVA professor Todd Scanlon. His team studies mercury, which is so pervasive that, as of 2008, fish consumption advisories have been issued in every state in the U.S., encompassing 1.3 million river miles. Fish absorb mercury, and eating lots of certain fish can present health risks for some people. Click here to see this image full-size. Just as the seemingly pristine beauty of the Blue Ridge Mountains defines one point of Virginia’s water trail, the barrier islands off the Eastern Shore constitute another. Sea grass once flourished in the region, but disease and a hurricane dealt a fatal one-two punch in the 1930s. The grass was no longer there to filter nutrients from the water, to provide shelter for crabs, oysters and scallops, or to anchor sediment that otherwise muddied the water. UVA scientists and students take samples of sea grass to study the effects of the restoration effort in Virginia’s coastal bays. In 1998, a local waterman discovered a small patch of sea grass, fueling discussions already under way that conditions could support seeding. The effort took off in 2001, with the Virginia Institute of Marine Science seeding the sea grass and UVA scientists and students—donning wet suits and snorkels—monitoring how the system is changing. Initially, they seeded small plots in a 200-acre span; now, healthy sea grass covers more than 4,000 acres, and the species is propagating naturally, constituting the world’s largest sea grass restoration effort. That means studying changes in water clarity, sedimentation and the return of marine species that depend on sea grass. One of the next steps along those lines, McGlathery says, is VIMS’ effort to restore scallops that once thrived in the region. As with other research, computer modeling, led by UVA’s Joel Carr (Col ’99, Grad ’11), helps forecast changes, including how sea grass would be vulnerable to variables like water temperature. But the past is also a guide. “This is an opportunity to turn back the clock to what it was like in the 1930s, when sea grass flourished in the coastal bays,” McGlathery says. Before smartphones, before tablets, before laptops, even before desktops—Jack Cosby and other UVA scientists were plunking away on keyboards in hopes of using computers to link science and society. 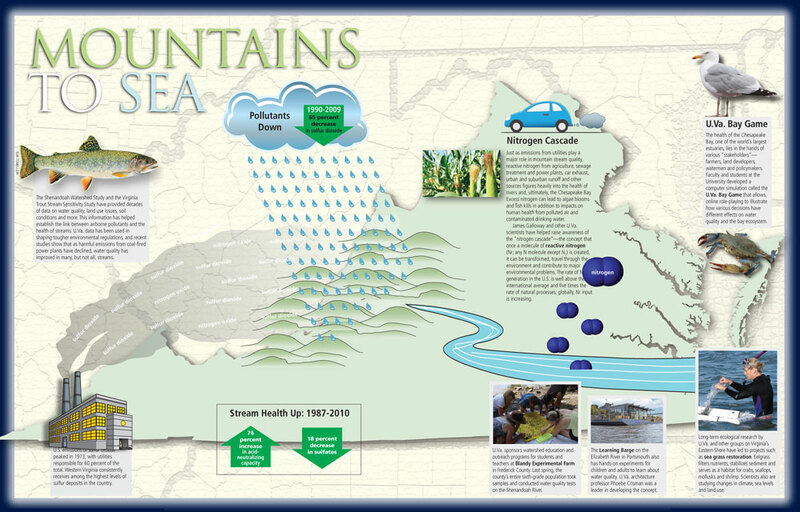 They used data collected through the Shenandoah Watershed Study, still in its early stages in the 1980s, not only to gauge the present but also to envision the future. They reviewed existing computer models for the EPA and determined none were sufficient to help scientists or policymakers. “That’s when we came up with MAGIC. When you talk about where science meets society, MAGIC is a good instance of that,” Cosby says. MAGIC now is used by scientists, regulatory agencies and policymakers around the world. It is an interactive computer program that allows users to enter data and determine the history of a site and, given certain variables, what’s likely to happen next in terms of acidification or nitrogen pollution. In addition to modeling, it helps monitor sites and ensure accountability for making improvements. UVA became the first university asked to join the Aqueduct Alliance, a global consortium of leading water experts.